US dollar index hasn’t stayed below 94 yet, but lost again today, 45 basis points, to fall 0.47% to 94.65. Gold/US Dollar index spread has sustained its breakout from late April and continued to rise. This is the most positive event in the gold market. GOLD and SILVER PRICES keep coming back like the Energizer Bunny. The GOLD PRICE today grabbed back $9.40 to end at $1,192.60. The SILVER PRICE rose 21.2 cents to 1651c. This is enough to make you bite your knuckles and tear your hair. Gold and silver wont rise through resistance (1680c and $1,200) but they also won’t fall away to new lows. I think the public is getting tired of waiting as well as becoming afraid of the economy and markets, because our business picked up again today. Markets today left me nervous. Interest rates are rising big time, which indicates failing confidence in central banks. May only be hedge fund money moving around, but if it gets out of hand panic will push folks into silver and gold. No confirmation the bond bubble has burst yet, and undoubtedly tomorrow or next day the Fed criminals will be firing off the Blarney Cannon to try to contain panic. Still, I don’t like it so I bought some gold and silver. But then, I’m just a nat’ral born durned fool from Tennessee who ain’t yet larnt to trust and respek my Washington and New York betters. They know what’s best for us little people — leastways, that’s what they tell us. Bursting of the bond bubble continues apace. Here’s a chart of the German 10 year Bund. Yield has shot from 0.08% to 0.68% since 20 April. Losses on long positions are huge. Probably all those big speculators who had been buying European bonds expecting the ECB to buy them through QE, which they did, figured that negative rates signaled time to sell. US bonds have “benefitted” from the selling wave, and there’s a huge number of bonds to sell, thanks to the European selling. US 10 year treasury yield fell today after rising strongly yesterday, and wound up at 2.260%. 50 year bond yield did the same and ended at 3.020%, up from February’s low at 2.226%. 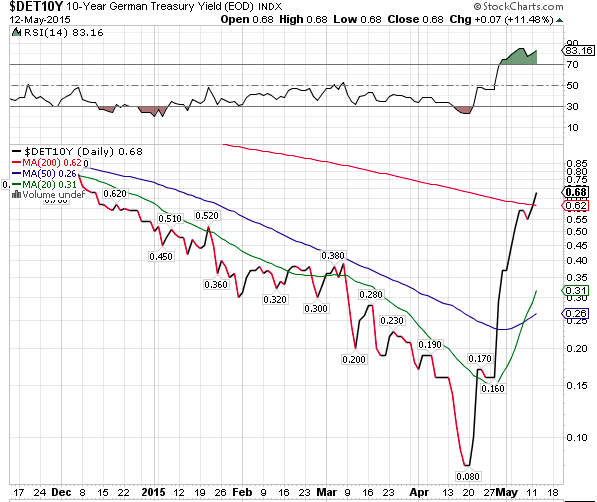 Both yields remain above the 200 DMA, so both are in rally mode, but that doesn’t yet confirm the bubble has burst. Still, Bloomberg Business reports today that more than $450 billion has been wiped out in global bond markets in the past few weeks. No end in sight. I keep trying to make the same point: it does stocks not a speck of good to rally 265 points one day, then give all that up the next two or three days. It only burns up buying power and sours investors. It also characterizes a topping market. Today the Dow lost another 36.94 to close at 18,068.23. S&P lost 6.21 (0.29%) and ended at 2,099.12. This is portentous action, buzzards circling above. By the way, indices were down across the board. Dow in silver and Dow in Gold continue falling.